This season’s most anticipated Padres rookie, Jedd Gyorko, entered the big leagues with the reputation of being a good hitter. Of course until you see a player take his hacks in the majors you never know if his reputation is justified or if Gyorko is just another over-hyped prospect in a long line of busts in the sport of baseball. Two months into his big league career and I’m ready to say Jedd Gyorko is a legit, big league bat. Through 52 games and 216 PA, Gyorko has a triple-slash of .276/.338/.434. That’s not bad until you consider where his slash line stood at the beginning of May. Through April Gyorko’s slash line was a pedestrian (well, maybe a pedestrian with a broken arm would be a more appropriate description) .247/.317/.323. Gyorko figured something out and blasted 12 extra base hits (six HR and six doubles) while posting an OPS of .906 in the month of May. That’s not pedestrian by the way; it’s more Ford F-250. There are three factors that makes his performance more impressive to me. First, many rookies start off well but once teams gather enough data from their scouting reports and identify weaknesses pitchers start exploiting the hitter’s holes. In this case it’s Gyorko that’s made the adjustments and the Padres are reaping the rewards from his bat. The second thing that I find encouraging is his performance at home. In 105 AB at Petco Gyorko has 4 HR, 9 2B’s and has an OPS of .960. To put that in some perspective there are only two hitters in the major leagues that have a full season OPS higher than Gyorko’s home mark. Those guys are Chris Davis and Miguel Cabrera. If Gyorko can hit that well at Petco he can hit anywhere. I don’t expect him to continue at that pace at home but I also believe his lowly .548 road OPS is well below where it will be by the end of the year. 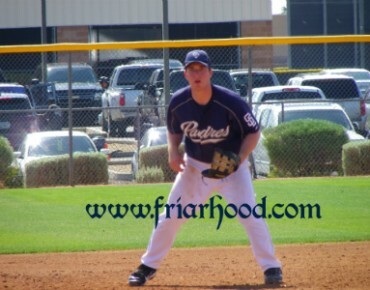 Lastly, I am pleased with his play at 2B. Considering he spent the vast majority of his playing career at the hot corner, his transition to the keystone position has gone remarkably well. He won’t be in the running for a Gold Glove but he’s at least been passable. He currently owns a UZR/150 rating of 4.1, good enough to rank 10th overall among qualified second sackers. Like I said, it’s not Gold Glove material but average to above defense plus a very good bat equals a very good player. The Padres were confident that Gyorko would hit at the big league level and it looks like they were right. They also believed he could make the transition to 2B effectively and he’s proving them right there too. I hate to go off of such a relatively small sample size but the early returns all point to Gyorko just getting started on what promises to be a nice San Diego Padres career.